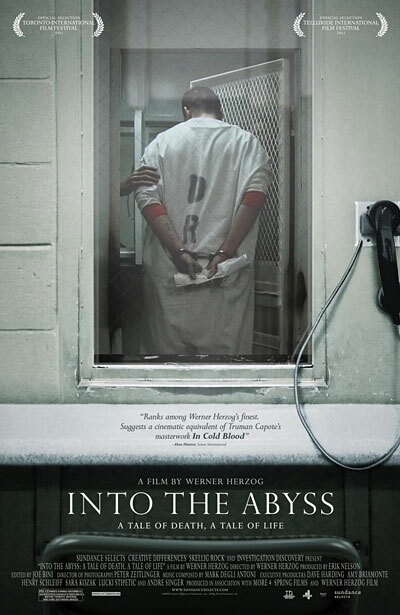 Herzog continues his Americana with Into the Abyss, a documentary about Death Row. It is perhaps the most somber Herzog film in years. There have been similar death penalty issue films like Errol Morris's Thin Blue Line, and more recently Joe Berlinger and Bruce Sinofsky's Paradise Lost docs, which actually helped to exonerate their subjects (or at least to have them out of jail). But Herzog rather concentrates on the impact of violence that is felt on both sides of the crime. He doesn't overtly state the institutional killing is wrong. But he certainly makes us think about it with a skillfully balanced filmmaking. Stripped away is Herzog's usual droll narration. Mostly comprised of interviews and crime scene videos, the film briskly moves on one scene to another. Michael Perry and Jason Burkett shot and killed three people while stealing a sports car in 2002. A senseless crime committed by a couple of 19 year olds. Perry was sentenced to death, and Burkett life imprisonment. In an interview with Perry, Herzog tells his subject upfront that he respects him as a human being and feels sorry for him that he has to die, but that doesn't mean he has to like him. Youthful and even jovial, 8 days before his execution, Perry tells Herzog his state of mind as a condemned man. "I'm going home or home either way." He cites 'hanging with the wrong crowd' as the root of the problem. It is evident in the interviews with friends and relatives of both perpetrators and victims, that in their lives there was a systematic pattern for unending violence, even in the suburbs of the American South: large numbers of family incarcerated, poverty, drugs, theft and felony. Serving a 40-year sentence for multiple felony charges, Burkett's father tells Herzog that he knew he saved his son's life when he saw two ladies in the jury crying after his tearful "Don't kill my son. He never had a chance," testimony during his son's sentencing. He says his most shameful moment came when he and his two sons (Jason's older brother is also in prison) got a chance to have meals together in the prison yard. There are definitely Herzogian moments: the red Camaro, the source of the three lives lost, still sits in a police impound. The sheriff explains why they had to move the car to another spot: the tree grew from underneath the car and came through the floorboard. Herzog also gets in some memorable lines, "Describe your encounter with a squirrel," and "Would Jesus be for the capital punishment?" over the course of the film. Then there is Mellyssa who is carrying Jason's baby. They fell in love when she worked as a legal assistant on Jason's case. She is coy about how she has become pregnant. Executions have an emotional impact on those who have to carry out the sentence as well. Herzog interviews a Texas man who had a breakdown after assisting in his 125th execution. Now, he opposes the capital punishment. A death row chaplain starts sobbing when he is asked about the last rites he performs for the inmates. "I can't stop the process, I wish I could." One must think of the recent execution of Troy Davis, a man whose trial was plagued by racial bias and police manipulation of witnesses. One of the arguments in the attempt to commute his death sentence was the potential psychological impact of forcing officers to perform an execution on a man whose guilt had not been established beyond a reasonable doubt. Lisa Stotler-Balloun, who lost her mother and brother to the crime, went to see the execution of Perry. Even though Perry's death can't bring her family back, she felt somewhat of a relief afterword. But when asked if the life sentence for the murderer would've satisfied her, she says yes. Its generic title could be applied to any number of Herzog films. But with no traces of cynicism or sly wit, Into the Abyss is a particularly straightforward documentary. Thoroughly inquisitive and contemplative, Herzog seems to be saying enough is enough. Into the Abyss made its debut at TIFF, Telluride Film Fest in September, it is an opening night film at Doc NYC on Nov.2 and opens in theaters Nov. 11 via IFC Films.